Greetings all its Mike Reed. I know its been a long time since you all have heard from me, but I have been keeping busy with everything going on with the site. Some of you who remember me knows that I absolutely love Modern and its generally the only format I play besides Standard, and Pauper occasionally. I am starting this column and will attempt to be doing this weekly. The goal of this column I am hoping to either give you insight on some of the top decks within the format or do what I am doing today and cover some very obscure decks, or brews as it seems this is. Without further ado I will jump into this deck and begin the breakdown. The deck I am covering today is called “Glorious Jeskai” the idea is to use the card Chance for Glory and abuse it using cards that keeps you from losing the game such as Gideon of the Trials and Platinum Angel. I am not sure the origin of the deck, but I did find it here. The player named “Milkk” went 5-0 about two weeks ago with it on modo. So just to start this off the original list actually had an Opt in it;however, I dropped it in favor of a third Path to Exile unless it is Storm I am not a big fan of Opt. Alright so this deck list is pretty sweet and I found it quiet hilarious playing against people online. This deck focuses on getting Gideon of the Trials or Platinum Angel to the field as quick as possible. If you can get those two cards down it turns on your Chance for Glory and your Pact of Negation both of which is the reason of the deck. So I went 4-1 with this deck while playtesting online. Below I am going to break down how the deck managed to do, the strengths and weaknesses I found in the deck. First round of my playtest I actually faced up against Bogles. Let’s just say this was a rough time. The removal package given to us is very limited and it needs to be for the deck to work. In our arsenal of removal we have the three paths as our spot removal with Snapcaster Mage to give us a potential extra three paths, and a single Gideon Jura for an emergency spot removal. 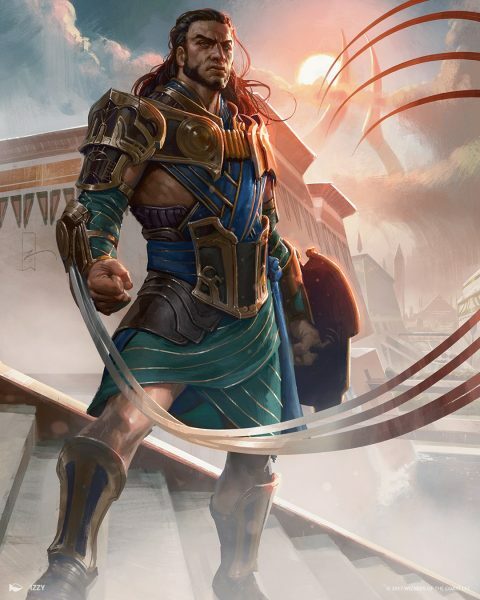 The deck also hosts three Lightning Bolt that can be used as removal, but you tend to want to use them for burn in most cases.The deck also features pseudo removal by negating damage using Gideon of the Trials, but can go against us in the long run with what we wish to do, which is attack with him. The sideboard also features two Anger of the Gods , and Elspeth, Sun’s Champion that can function as a board wipe. In all both games played out the same, My spot removal was dead against it, and so was the Gideon of the Trials due to the targeting. When I got Platinum Angel out on the field it was immediately pathed so for Bogles this was a easy 2-0 victory, and given my new experience with the deck I have to say I was quiet concerned with how this deck would end up playing out. So third round had to be the most absolutely boring match I faced all evening. I faced against Ad Nauseam, and I am assuming it was an odd build to Ad Nauseam because both games he kept a two land hand, and ended up scooping turn four both games. Only reason I knew it was Ad Nauseam was because he had to discard one to the graveyard. I won this round with a bad taste in mouth for that but it was a 2-0 win. So fourth round was absolutely fun. I wasn’t expecting the deck I faced. The deck was an Boros Mentor aggro deck, the deck ran Tajic, Legion’s Edge, Skyknight Legionnaire, Cerodon Yearling and Aurelia, Exemplar of Justice. I am unsure if there was other mentor cards in there, but this deck was surprisingly fast and fun to play against. First game I was able to bolt his few creatures early on, on top of paths, and snapcaster these spot removals. This game was actually won out by the turn three Gideon of the Trials that landed and just swung every turn following. Game 2 he used Boros Charm on my Gideon and the game was just over afterwards. I drew both my Platinum Angel followed by drawing two of the Madcap Experiment. Game three was the nail biter, my opponent mulled to six, but was able to dump four creatures, three lands, with two cards in hand by turn four. I ended up throwing down two angers plus the sacrifice of a Gideon. After that I dropped Madcap Experiment, and three out a Chance for Glory the following turn he conceded and let me know he removed his paths, because he hadn’t saw either of those cards during our previous two games. This round went to me 2-1, with a record of 3-1 so far. So the last round was probably the one I had the most fun with personally. I don’t know what he was playing and if you are reading this please comment and let me know. My opponent was using the tron lands with Kodama’s Reach, Steel Leaf Champion, and Paradox Engine. Honestly for the first game I was simply unable to stop double champion by turn four since none of my removal was in hand. The second game I was able to grind my opponent out by finding all my paths and dropping platinum angel down to secure the long grind. Third game I dropped a turn three Gideon, and was able to chain two Chance for Glory and used two Pact of Negation on the following two spells he played. Gideon was able to just mop the game up for a solid finish. In conclusion, I feel like this deck is absolutely a blast to play with, and I think it could definitely tackle some local Modern events or even a FNM, but I don’t see it winning big unless someone just gets absolutely lucky with this deck. The absolute all-star of this deck is Gideon of the Trials I secured the most wins or completely took the game when this little fella hit the field. If your opponent has a fast start against this deck you get blown out of the water and that is a serious weakness considering the meta currently. I wished there was a way to trip the madcaps, and I felt Jace, the Mind Sculptor was useless in the sideboard I never once attempted to use him. Welp that is all I have for today I hope you enjoyed this Modern Report and I hope to see you back with the next column. Feel free to hit me up at any of our social medias with deck techs, or suggestions on what I should cover! Be sure to keep in mind that Black Friday is approaching and if you get any of your Magic products from Inked Gaming be sure to take advantage of both their Black Friday deals and use our code “TECHS10” for your extra ten percent off during this Holiday! magic, magic the gathering, modern, Modern Report. Bookmark.